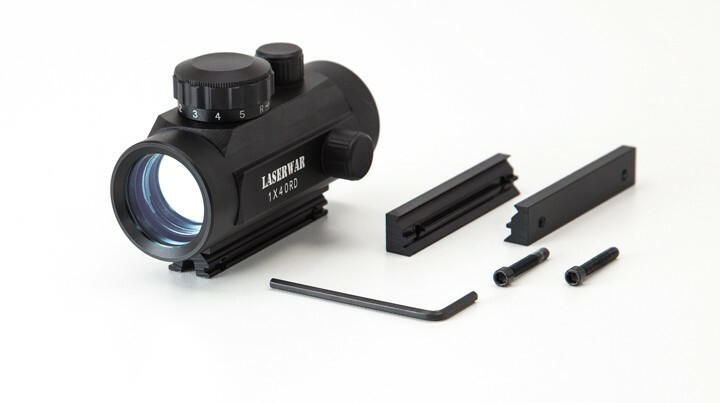 1x40RD collimator sights (or red-dot sights) are equipped with a universal mount that can be perfectly set on “Weaver rail” or on “Dovetail”. As the aiming mark, we use the LASERWAR crosshair. It is available in two colors: green and red. For better use in twilight or amid vegetation, our collimator sites have a selector which allows you to adjust the brightness of the cross-hairs: you have 5 modes for each color. So, the player can make his own optimal setting depending on playground conditions. Correction adjusting sensitivity of collimator sight is one arc minute. The package includes a collimator sight with fasteners, hexagon, wiper for the lenses and protective caps.